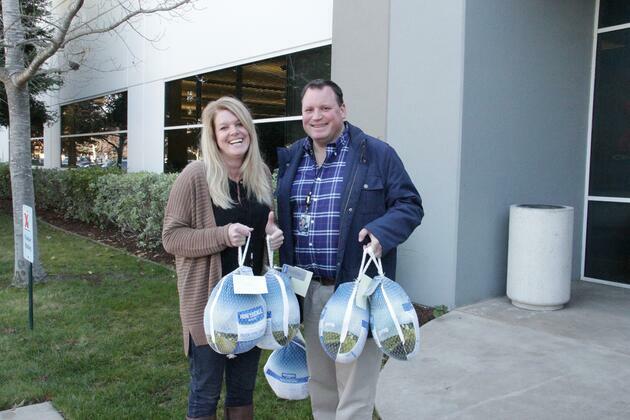 Petaluma, Calif. (November 18, 2016) — CrossCheck, a leading provider of check processing services in the nation, has donated 85 turkeys to COTS (Committee on the Shelterless) to feed hundreds in the community on Thanksgiving Day at the Petaluma Kitchen. 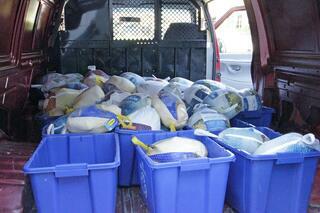 This is the sixth consecutive year that CrossCheck employees have participated in the program, bringing the total weight of turkey contributions to nearly 10,000 pounds since 2011. COTS provides over 300 meals every day and 350 food boxes every week to families, adults, veterans and disabled members of the community. This steady supply of nutritious food allows people to avoid making a difficult choice between buying food and paying their rent. In other community service, employees have assisted victims of national disasters through the American Red Cross and the company’s independent efforts. They also support the Salvation Army’s Angel Tree program and the American Cancer Society’s Relay for Life. In 2015 and 2016, donations were distributed to help victims of hurricanes, earthquakes and a tsunami as well as victims of the North Texas tornado and the Valley Fire in nearby Lake County, California. Located in Petaluma, California, the Committee on the Shelterless (COTS) is a human services organization that facilitates housing for families, adults and military veterans as well as wellness and food programs for the local community. COTS was founded in 1988 as an expression of Mary Isaak’s and Laure Reichek’s concern for children and adults who were sleeping outdoors in culverts, dumpsters or other unsafe and unsuitable conditions. Visit www.cots-homeless.org or call 707-765-6530 for more information or to learn about volunteer opportunities. CrossCheck, Inc., an established leader in the payment solutions industry, processes billions in check-transaction dollars annually throughout the United States. Since 1983, it has helped increase profits and reduce risk for businesses in verticals such as automotive, auto aftermarket, building materials, home furnishings, specialty retail, medical-dental and veterinary by providing efficient and affordable check verification, guarantee and conversion services. CrossCheck’s suite of services includes check conversion technology, web-based transactions, remote deposit capture and premium products for specific industries and applications. The company has offices in Petaluma, California and Irving, Texas.